If you really like the way Mac OS X Lion looks on a Mac, you might be inclined to try it out on the PC, too! Hamed Danger of DeviantArt has created a stunningly similar theme for the Windows 7 system which looks a lot like the Mac OS X Lion theme, but as mentioned, it's for Windows 7 systems. He does an excellent job of making Windows look like the new Mac OS X look and the emulation he pulled off is impressive. As you can imagine, though, this Windows 7 theme does not include the actual functionality of a Mac. For security reasons, you should also check out the Mac OS X Lion Skin for Windows 7 download at LO4D.com which includes virus and malware tests. Additional screenshots of this application download may be available, too. 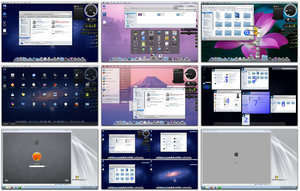 Mac OS X Lion Skin for Windows 7 has a presence on social networks.